I’ve read Gatsby a number of times: first in eleventh grade, again before the end of high school, at least once in college and at least once since. I’ve written multiple papers on it, and would give it my vote for Great American Novel if I had to choose just one. Which is to say, I felt I knew it sufficiently well so that I didn’t need to re-read it again before my book discussion at the library. Greg Olear, author of the Salon piece, included significant textual evidence to back up his claim. As the narrator, Nick is responsible for introducing each of the other characters to the reader. 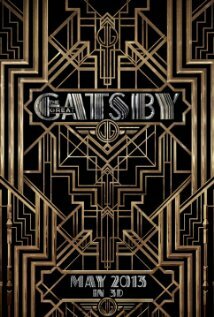 He describes the men and the women very differently; he notes Daisy’s voice, Jordan’s posture, and Myrtle’s dress, but he describes Tom’s physicality and Gatsby’s air of favorable understanding. Olear also draws the reader’s attention to the scene between Nick and Mr. McKee, which I had forgotten about, or never really noticed or understood; but, as Olear points out, in a book that is so economical with words, surely Fitzgerald wrote that scene for a reason. Even if it isn’t true – and who’s to say? – it’s an interesting lens through which to read the book, and it will be interesting to see how they reinterpret the story for the screen this time around (IMDB now says the release date is May 10). Interesting stuff. I taught Gatsby earlier this year to my students (11th graders), and they picked up on the possibility of Nick’s homosexuality (at the end of the 2nd chapter, I think, when Tom takes Nick into the city and he ends up in a male stranger’s bedroom, apparently). When I told them that besides his seeming infatuation with Gatsby, there isn’t much else in the book devoted to the subject, they mostly shrugged it off. I hope you enjoy the adaptation (I’m looking forward to it quite a lot). Interesting! None of my teachers ever mentioned the possibility – it was all about the symbolism of the green light at the end of the dock, and the eyes of Dr. T.J. Eckleburg. Either way, it’s still a masterpiece. I hope the movie does it justice. The teens in my Teen Advisory Board have mentioned several times that they often don’t like movies that are based on their favorite books. Examples came up such as Beastly by Alex Flinn, I am Number Four by Pittacus Lore, Speak by Laurie Halse Anderson and The Golden Compass by Philip Pullman (this last one I was so excited for and so let-down by). We’ve even talked about making a booklist called something like “Read the book but DON’T watch the movie”. Your recent musings on original v. adapted films reminded me of the infographic on this page: http://www.shortoftheweek.com/2012/01/05/has-hollywood-lost-its-way/. Pretty interesting/distressing, huh? Brita, that article is fascinating. I’ve definitely noticed the upward trend in adaptations (movies from books) but because I rarely see the sequel-spawning franchises (except for Harry Potter, Hunger Games, etc., which are from books anyway), I hadn’t paid as much attention. That chart is pretty startling. Thanks for sharing! I’ve read the book and seen all the extant previous adaptations, and thought it was superb. The Redford version was far too self-conscious ‘classic adaptation’ and soporific: more Jane Austen-tedious than Jazz-Age. The 1949 film was hampered by the Hays Code, but Alan Ladd was excellent in it, and indeed, DiCaprio conveyed similar qualities in the new version. I also admire the 2000 BBC adaptation (Toby Stephens and Mira Sorvino) but of the cinema versions, this is the best.